104950 White Matte Poly Piggyback Label has a matte white polyester Facestock that provides excellent print quality in laser printers. It is constructed with one layer of waterproof poly Facestock and two layers of paper liners with adhesive, so the label can be applied to one surface then removed and applied permanently to another surface. 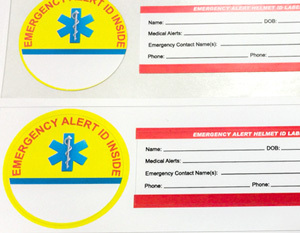 Labels can be standard die cut through both adhesive layers, or stepped die cut to create master labels from which sub-labels can be removed and applied to other surfaces. The clear acrylic adhesive is adaptable to many surfaces with a minimum application temperature of 32°F and a service range of -4°F to 176°F.